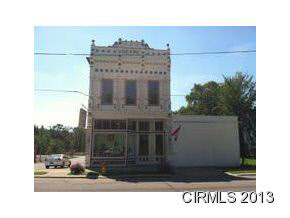 Historical building in downtown Logansport. Newly remodeled on main level, 3500 sf newly remodeled finished store front, heated and air. Second level has been framed and ready for apartments or whatever you prefer with 3400 sf. Basement has 7740 sf with semi delivery door. Rubber roof on complete building. New wiring, new flooring, heating/ca. Also loading dock on east side of building. Ready for new owner.